Background: The dose of unfractionated heparin (UFH) during cardiac catheterisation procedures is still an area of debate. The ESC guideline recommends using a weight adjusted dose where as the AHA guideline recommends adjusting UFH dose according to target ACT. These recommendations are based on older and mostly non randomised studies. A recent meta-analysis of the randomised trials looking into optimum ACT level during coronary intervention was inconclusive and recommended more research in this area. Methods: Two operators used heparin at 70 IU/Kg in the weight adjusted arm and 5000 IU in the fixed dose arm respectively for most of there cases over a period of 13 months from December 2014 to December 2015. 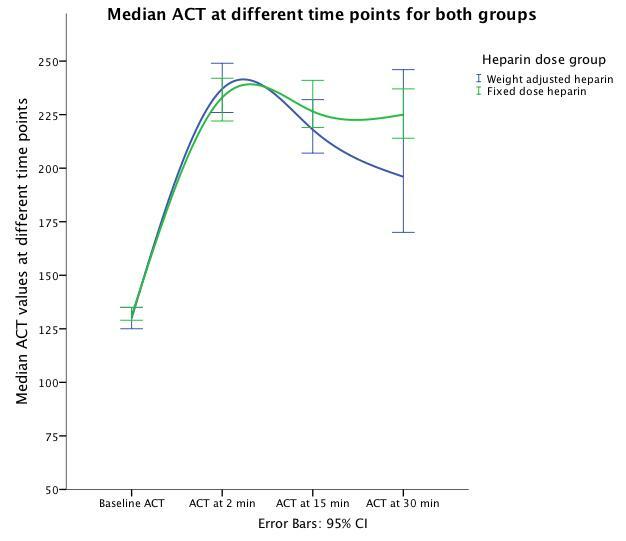 ACT was measured at baseline and then at 2, 15 and then at 15 minutes intervals with further dose of heparin given at the operator's discretion. The local database was searched retrospectively and cases were included if baseline and two of the 2, 15 and 30 minute ACT were available. ACT values after further dose of UFH were excluded. ACT values were compared between the two groups. T test or Mann-Whitney u test was used for continues variables and Chi square test was used for categorical variables. Result: 93 cases in the weight adjusted group and 166 cases in the fixed dose group met the inclusion criteria. The baseline characteristics were similar as shown in table 1. The weight adjusted group received more heparin (Mean difference 842 IU, 95% CI 633-1051, P<0.001). There were no difference in median ACTs at 2 minutes (N= 91/161; 237, IQR 215-267 vs 233, IQR 210-291; P=0.97) and 15 minutes ( N=57/118; 218, IQR 198-247 vs 226, IQR 204-257; P=0.21) but at 30 minutes post heparin, ACT for the fixed dose group was higher (N=14/75, 196, IQR 174-228 vs 225, 205-258; P=0.018). Figure 1 shows the trend of ACT over time with peak ACT reached at 2 minuts in both groups. Figure 1: Trend of ACT over time. Conclusion: This study shows that a fixed dose of 5000 IU of UFH archives comparable or slightly higher ACT over a period of time compared to a weight adjusted 70 IU/Kg dose while reducing the total dose of heparin given to patient.